158 MMS November 2017 mmsonline.com FABTECH 2017 November 6 - 9 9 0 0 1 C E R T I F I E D ISO HOLD IT Make it te-CO if you want to reduce costs and set-up time, maximize flexibility and productivity, and consistently produce quality parts. Also available in hydraulic configurations. www.te-co.com 800-543-4071 with extreme accuracy, precision and flexibility and power tools from its comprehensive line of metalcutting and finishing products, including files, burs, brushes, grinding and cutting wheels and power tools. The company will also feature its PferdValue program, focusing on products designed to increase labor efficiency, operator health and safety, and overall process optimiza- tion; its PferdErgonomics program, focused on reducing noise, vibration and dust; and PferdEf- f iciency for optimizing factors such as time, energy and material waste. Pferd Inc., call 800-342-9015 or visit pferdusa.com. 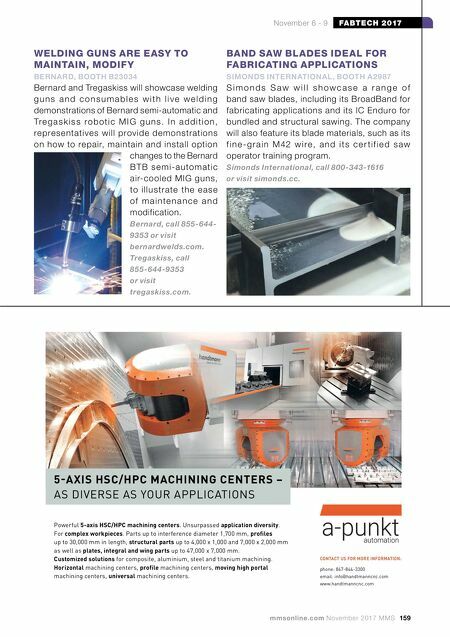 DIE GUIDING ELEMENTS AND DIE SETS DESIGNED FOR HIGH SPEED, VOLUME AGATHON MACHINE TOOLS INC., BOOTH A5177 A g a t h o n M a c h i n e To o l s f e a t u r e s i t s l i n e of precision die guiding elements and die sets for stamping and moldmaking. Made of high-quality materials with tight manufactured tolerances and superfinished components, the tools are designed for high-speed, high-volume metal stamping dies, precision plastic molding dies, OEM machine builds and automation applications. The company also introduces its line of round fine centering systems for wear-free alignment of two cavity halves in moldmaking and automation. 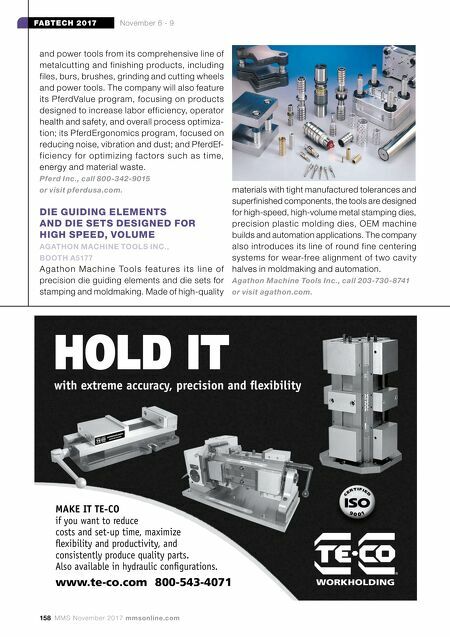 Agathon Machine Tools Inc., call 203-730-8741 or visit agathon.com.